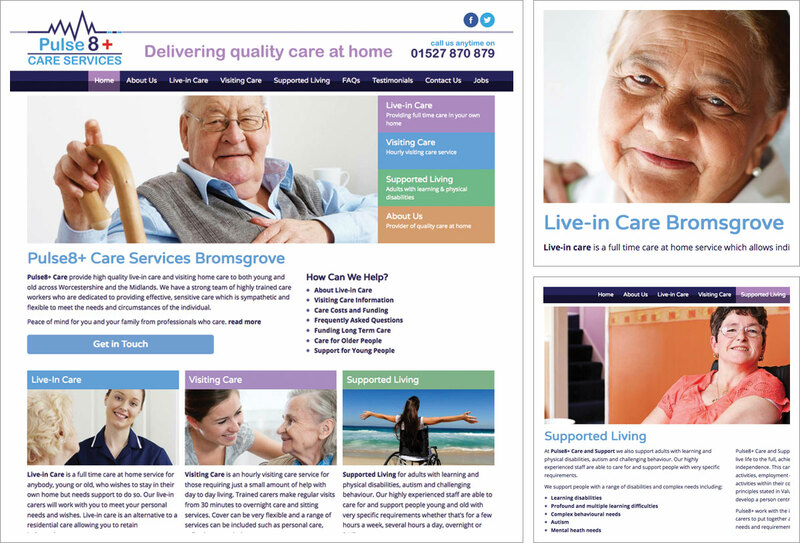 Worcestershire Care Providers Pulse8+ Care deliver high quality care at home. The website was orginally developed some years ago and has recently undergone a refresh to include the introduction of a responsive framework which means the website can be more easily navigated using a mobile phone or tablet. Pulse 8+ Care took this opportunity to review and revise their on-page content and add some new images. The ‘Meet the Team’ page has been expanded, some new graphics and improvements to the navigation options were also implemented. The general look and feel of the website was retained as this was already inline with their company image. The website provides information about the services providd by Pulse8+ Care including Live-in Care, Visiting Care and Supported Living and also festures many, many customer testimonials from those receiving care and their family members. This is a WordPress website with much scope for future development. Basic on-page search engine optimisation. Web Hosting provided by Pedleyonline.